Yesterday marked my first official day as the President. I think most of you have had an opportunity to read my business plan so I am going to keep my inaugural comments brief. If you have not then please feel free to email president[at]ucip.org and I will send you a copy to peruse. 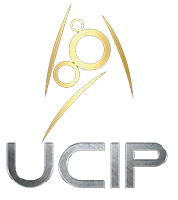 Also, I am sure people have noticed that I am using the “crop circle” version of the UCIP Logo. Since we have passed our 20th anniversary I am moving back the old logo design. The primary reason for this change is to prevent any future issues with a logo that resembles trademarks owned by Paramount and CBS. I think the “crop circle” is both unique and simple enough to be used as part of the organization’s future brand. The Census will be conducted through the sim command teams and they should be sending you details about the information (very basic) that we are asking for over the next week. The census will give us a way to measure where we are currently and as a value for comparisons later on to determine what progress or perhaps even regression we have made over the course of the year. My goal is to have the results announced by August 31st. In term of sim development I am reopening the process for new games so we can get some fresh new sim concepts into the organization. Ideally I would like to eventually see the return of a Colony based simulation, a Starbase simulation, a Romulan simulation, and finally a Klingon Simulation. There are other niche games I would like to see but I consider those the ideal. So my first act as President is the announcement that Sim Development is OPEN. I also plan on doing monthly status updates for the organization. These status updates will contain information about our progress and what we are currently doing. About the Sims and what they are doing-both IC and OOC. I will also be encompassing sim/member awards into the monthly updates which we be sent during the first week of any given month. There are also plans to hold a members meeting sometime during the month of September. I will give more details about that in the September monthly update. So be sure to check the September update if you want to attend the meeting. I also wanted to mention that all official correspondence with me needs to go through the president@ list. I don’t mind discussing things on IRC but I will only make a decision (on non-menial items) through the president@ list. I feel this is the best way to ensure that an adequate record is kept of previous decisions. This is mainly geared towards sim commanders but it also involves membership in terms of conflict issues. Please allow at least 72 hours for me to get back to you regarding any issue sent to the President@ list. I’ll normally get back to you sooner but 72 hours allows me plenty of leeway while also being fair to the sender. Donald will be retained as Chief of Staff and he will have full discretion of structure the department as he wishes. For the moment I will continue to have operative control of the Fleet Operations department over the month of August since there is nothing that requires to fill the position. I plan to call for apps during the first week of September after drafting a set of requirements for the new Chief of Fleet Operations. I will list some of the things I will be looking for below. *A member who will be able to work with and write with all members of the organization regardless of any personal or professional differences. The call for application will have more details so if you’re interested please look out for that during the first week of September. 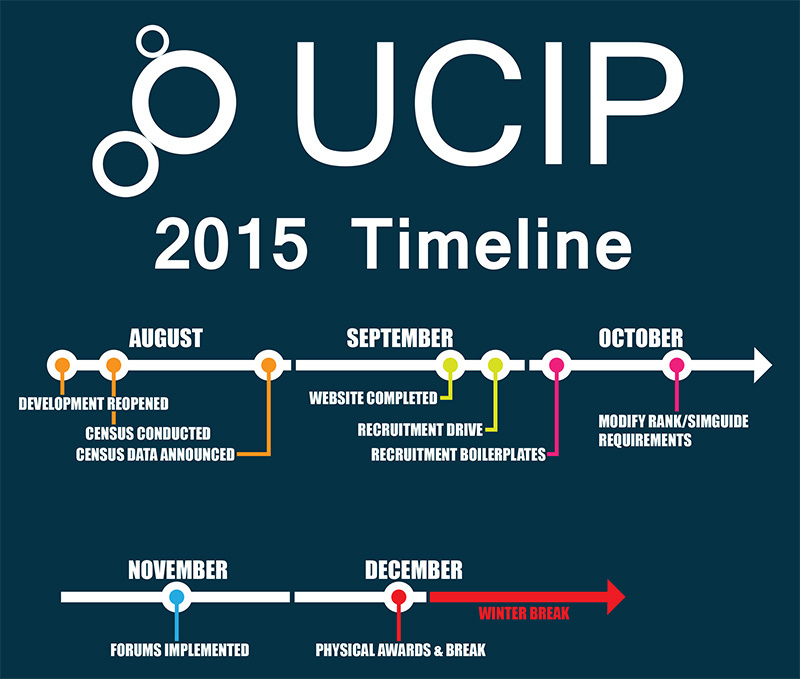 Attached to this document is a timeline I have drafted of our goals going forwards through to the end of the year. The timeline is simply to allow people to get an idea of what we want to do and when want to have those objectives completed by. A lot of the things noted on the timeline may be completed much sooner then mentioned. However, I have decided to be conservative with the estimates so that we don’t under deliver. The timeline will be edited as we move forward so consider it to be a fluid document that can change regularly. Finally, I want to thank Mike for his service to the organization as President over the course of the last year. I recognize his work I hereby award him the Legion of Merit. I also wanted to mention a bit of somber news that I was informed of recently. A previous member of UCIP, Tyler J. Smith, passed away towards the end of last year. For those who do not remember Captain Smith he served as the XO of Starbase Aurora under Karen McElester and also as a staff member of Epsilon Subfleet. Aside from being a great writer Tyler was also very talented web and graphics designer. Anyone who served in UCIP at the time will remember his amazing graphics for Epsilon Subfleet and UCIP as a whole. In memory of Tyler and his contributions to the organization I will be creating an award for excellence in web and graphic design in his honor.